When wiring house or building, a lot of mistakes can be made and will only be visible during inspection or after many years. Some of them can create small damages while other can lead to serious injuries. It is therefore important to take your time when wiring, respect the norms and regulations of your national board or call for an inspector who will be happy to guide you. 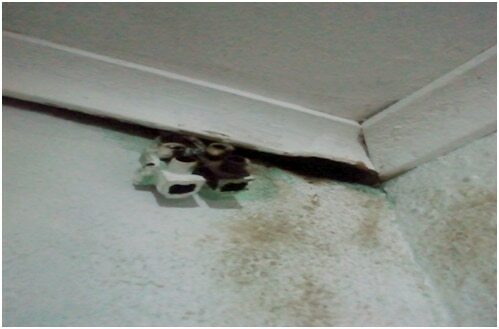 This is frequent in receptacles, or light fixtures. The exposition of a cable can cause short circuit if it is closes to another wire or a metal. Solution: reconnect it again. You can wrap the wire around the terminal for better insertion. 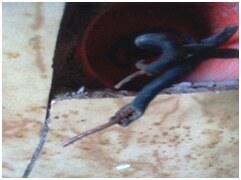 During installations you might find some nicks wires due to lack of maintenance or careless when purchasing them. Such cables can increase overheat. Solution: cut the damaged parts and strip the cable again before reconnecting it. Present on walls, ceiling, inside or outside a building. They can be cut accidentally (by children or workers) while damaging the cables leading to severe injuries if loaded. 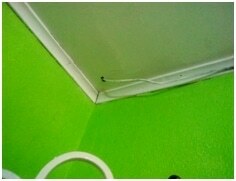 Solution: the cables should be well fixed 1 1/4 from the edge by using plastic staples. This is one of the worst mistakes I have ever seen. I have never understood why it is necessary for an electrician to hide electrical boxes inside ceiling or behind drywall. No! No! No! they should be visible and available for further problems or systems failures. Inspection and maintenance will be done more easier while avoiding costly repairs and renovation. Solution: the only and correct solution here is to let them accessible to everybody , at distances recommended by the regulation board . 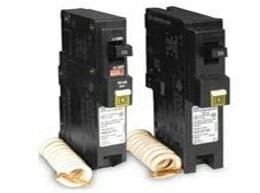 Circuit breakers are used for the protection of equipment and persons In case of short circuit or overload. Very often, This mistake is due to the misinterpretation of the new codes and rules of the national board . It is therefore important to stay updated. While standard circuit breakers are tolerated in some locations and jurisdictions there are prohibited in other regions. GFCIs(Ground Faults Circuit Interrupters) and AFCIs(Arc Faults Circuit Interrupters) are mostly used nowadays and electricians should know in which circumstances and installations they should be adapted. Solution: keep learning and call for an inspector in case of any incomprehension. If electrical tape represent a good idea as a temporary solution, it is not recommended to use it permanently. It can deteriorate over time. Wires should never be left with any protection in order to avoid electrocution. Solution: Always use wire connectors. There are available anywhere in various forms. 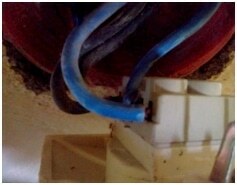 You might think that because your wires are well connected and protected you can live the box like that .No it is not safe, your work is uncompleted and looks very unprofessional. Solution: cover the box with a proper metal or plastic plate and fix it well. You will find it anywhere online or in a real shop. Connections cannot be well done due to the lack of space. 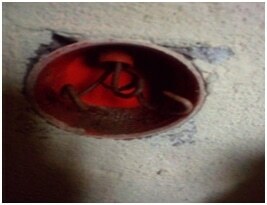 this mistake cause an overheating inside the boxes which lead to potential electrical fire. Solution: use a larger box and respect the general rule of thumb which consists of using 6 inches of wires in a box to make it look proper and free from any system interruption. Contact your regulations board to learn how to size cables in a box. Old receptacles were designed with Hot and neutral screw and were widely used in installations but norms have changed since then and it is recommended to only use receptacle with a third ground connection. 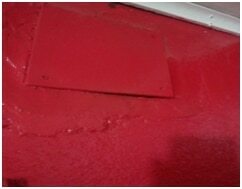 Especially in basements, you might intend to use plastic staples under the floor to fix the cables but this method is prohibited by the laws in force. Solution: drill holes as recommended by the regulation board or use a running board to fix cables on it. 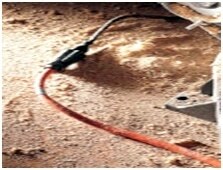 It is very common to use extension cord in wiring project to plug material or appliances in where you can’t normally. 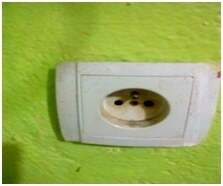 But very often workers use extension cords that are not well adapted to run such appliances due to their small power. These extension cords can cause overheat, which invite fire. Solution: choose an extension cord with the same (or greater) wattage and current than the load. Note: Never use an extension cord as a permanent wiring. It is not designed for that. During an installation take your time. Although this fault is not common for certified electrician it might occurs that due to some unknown reasons you reverse the polarity of the receptacles. Hot and neutral wires have their dedicated locations and it is indicated on the device. Solution: always check if outlets are well connected by using a circuit tester and if repairs need to be done connect a hot wire to the brass-coloured terminal and the neutral to the silver connection. 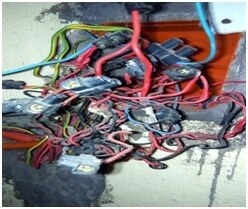 When tackling an electrical work, it is your duty to do your best and submit high standard results. You are responsible of the installations done and the life of people who will work or live in that building should be keep saved. Always purchase good material, stay updated about electrical norms and regulations and call for inspection. Projects are different so never underestimate the work that you intend to do. Can you list more errors? Do you want to share other solutions? Tell us in the comments area below! or copy this trackback: http://engineering.electrical-equipment.org/panel-building/12-common-errors-electrical-installation.html/trackback from your own site. I like that you talked about it being easy to choose the wrong circuit breaker panel installation when you’re working on doing electrical projects. We’re working on rewiring my parents home, and I think that making sure that the electrician who does our circuit breaker panel installation picks up the right one! I’ll have to do a little research about our circuit breaker panel after its installation, and see what I can find! Thanks for the info! 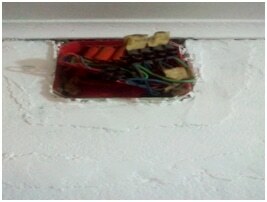 The overcrowding of the wires in outlet box is the most common error I saw made by the professionals even. Some of them never address it while doing the installation at home. It later causes problem when your outlet catches fire because wires get interconnected. There are some best electrical installation. I am very thankful for you and your blog. I am very impressed by your blog. Thanks for such a great information.